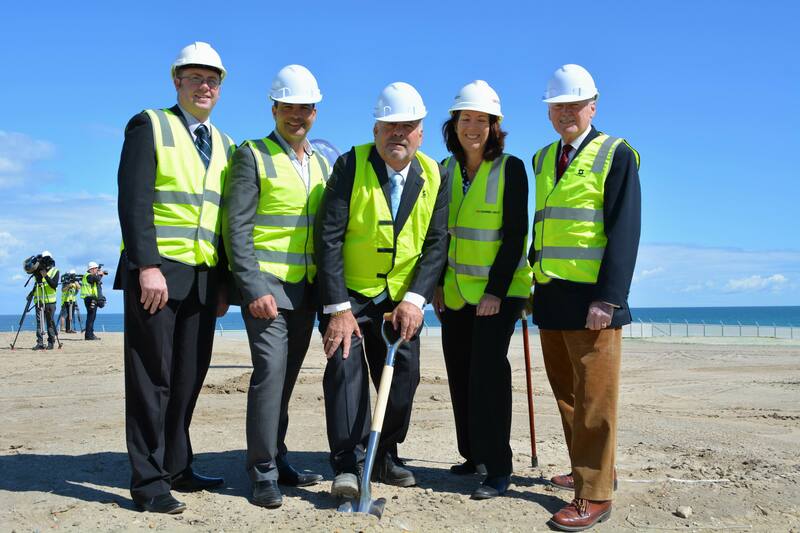 MAYOR Giovanni Italiano returned to his building and construction roots, turning the first sod at the $26 million Scarborough Beach Pool site today. . The 50m geo-thermal heated pool is set to be completed by Christmas 2017 and open to the public by January 2018, according to the Mayor. “Not only does today mark the beginning of official construction of our long-awaited 50m outdoor heated pool, but it also marks a day that many residents have waited for over 16 years for a replacement for the old Scarborough Beach High School Pool,” Cr Italiano said. The pool will cater for learn-to-swim classes, senior and junior swim squads and water polo. A separate leisure pool will be heated at 32C all year round and will feature spectator seating, change rooms, family areas and a cafe. Cr Italiano said the pool would be safeguarded from high tides, sand and the elements with protective barriers. “If too much sand gets into the pool it won’t be good and will be a lot harder to keep it clean so all those elements have been taken into consideration,” he said. Cr Italiano said the pool would be the “jewel in the crown” of the Scarborough redevelopment. “We’re the largest local government and by us putting a pool here at the beach I do hope that others take our lead because I’m sure this will be the best place to come, here you’ve got the benefit of swimming in the pool or going down to the ocean,” he said. Head Contractors appointed for the construction of the project; Cooper & Oxley officially took possession of the site late last week after forward works were completed as part of the broader precinct forward works by the MRA. “The new 50m heated outdoor swimming pool will integrate an elevated restaurant on the mezzanine level with inside and outside dining accompanied by panoramic ocean views for visitors to enjoy and a ground level beach cafe catering to pool users, beach goers and the general public,” he said.